If, at some level of the cluster history, there is a tie for minimum distance between clusters, then one or more levels of the sample cluster tree are not uniquely determined. This example shows how the degree of indeterminacy can be assessed. Mammals have four kinds of teeth: incisors, canines, premolars, and molars. 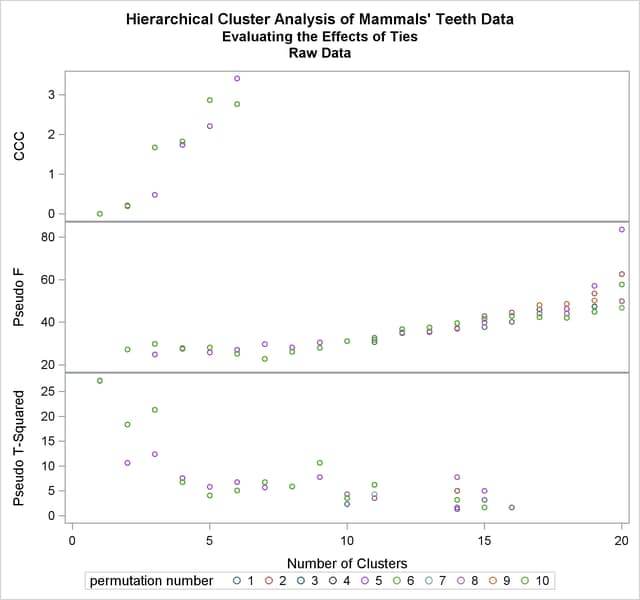 The following data set gives the number of teeth of each kind on one side of the top and bottom jaws for 32 mammals. Since all eight variables are measured in the same units, it is not strictly necessary to rescale the data. However, the canines have much less variance than the other kinds of teeth and, therefore, have little effect on the analysis if the variables are not standardized. An average linkage cluster analysis is run with and without standardization to enable comparison of the results. There are ties at 16 levels for the raw data but at only 10 levels for the standardized data. There are more ties for the raw data because the increments between successive values are the same for all of the raw variables but different for the standardized variables. One way to assess the importance of the ties in the analysis is to repeat the analysis on several random permutations of the observations and then to see to what extent the results are consistent at the interesting levels of the cluster history. Three macros are presented to facilitate this process, as follows. The following statements produce Output 33.4.3. The following statements produce Output 33.4.4. From the TABULATE output, you can see that two types of clustering are obtained. In one case, the mole is grouped with the carnivores, while the pika and rabbit are grouped with the rodents. In the other case, both the mole and the lagomorphs are grouped with the bats. Next, the analysis is repeated with the standardized data as shown in the following statements. The pseudo F and statistics indicate three or four clusters, while the cubic clustering criterion shows a sharp rise up to four clusters and then levels off up to six clusters. So the TABPERM macro is used again at the four-cluster level. In this case, there is no indeterminacy, because the same four clusters are obtained with every permutation, although in different orders. It must be emphasized, however, that lack of indeterminacy in no way indicates validity. The following statements produce Output 33.4.5. The following statements produce Output 33.4.6.